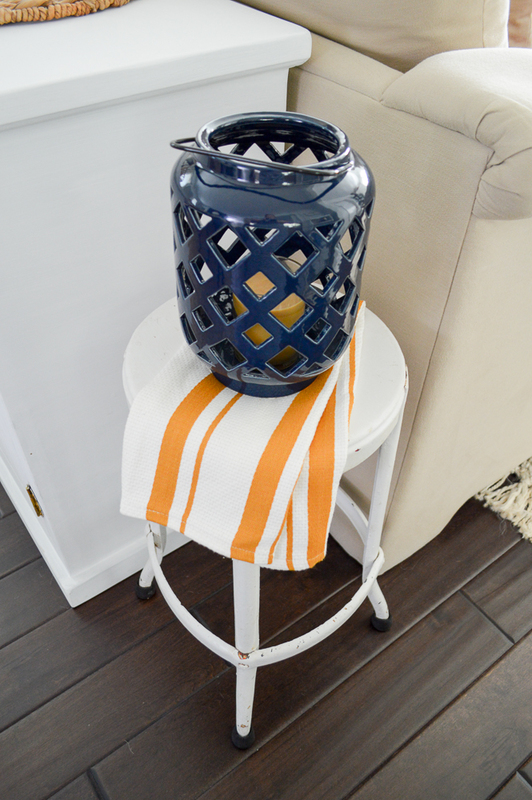 Proudly partnering with Better Homes and Gardens at Walmart for today’s post. Affiliate links are provided for many of the items you’ll see. All ideas & opinions are mine. 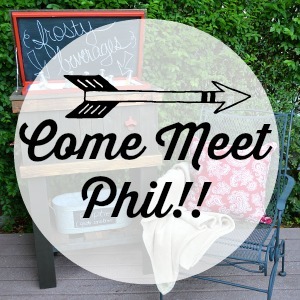 Hi friends! As we settle into the new season, with Halloween upon us & Thanksgiving next month, I think it’s safe to say we are all in full Fall Swing! I’m finally there, ready to fully embrace it! 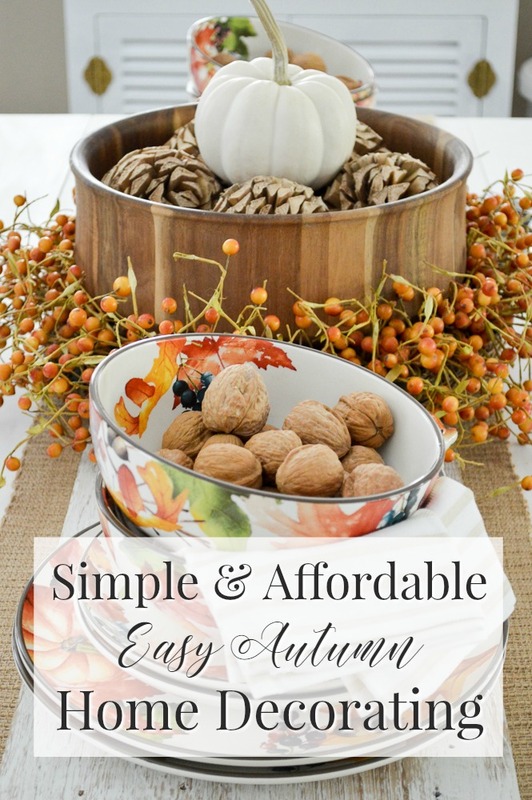 And I’m so happy we had a rain free afternoon so I could share my latest Autumn home decorating project with you, a simple Fall table. 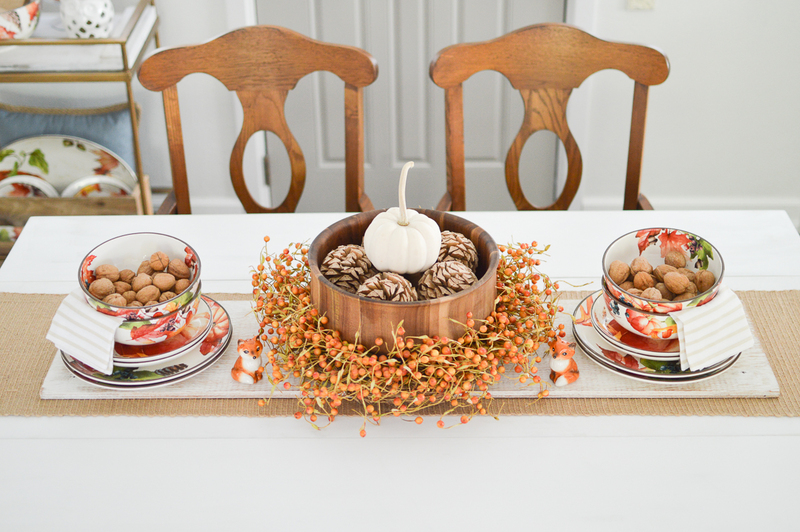 Since I also don’t like to wait until the last minute… and really, you can’t these days because everything flies off the shelves like leaves in an Autumn breeze… I bought my Fall table decor early in anticipation of setting a Thanksgiving table. It’s so pretty, I decided instead of washing it and putting it away until the big day, I’d enjoy it. Why hide it for the next several weeks, when it’s so pretty and festive? 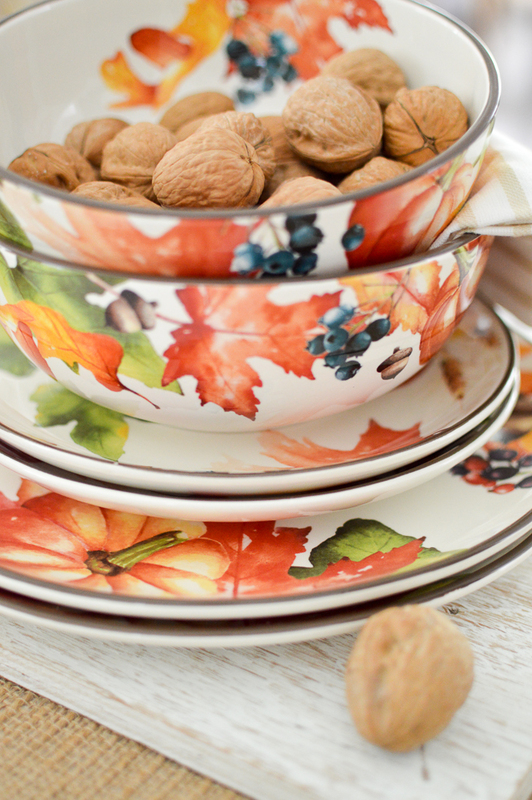 Last year I bought a few pieces of the limited edition seasonal collection, and this year, I indulged in the plates and bowls! They are so pretty and they coordinate with what I bought previously so that was an added bonus. 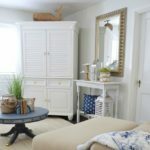 I used to be very, “I need to see it and touch it” before I can buy it, but I’ve had such good luck with buying my Better Homes and Gardens items online, that I’m actually a little bit spoiled with the to-my-door deliveries now, and the selection online is greater than what is carried in-store. 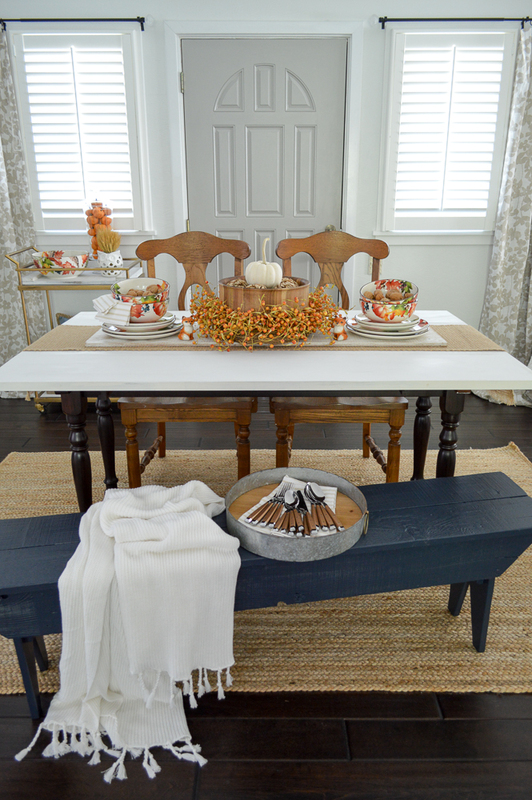 Since our fireplace is in the dining area, I decide to sprinkle Fall all over the room. 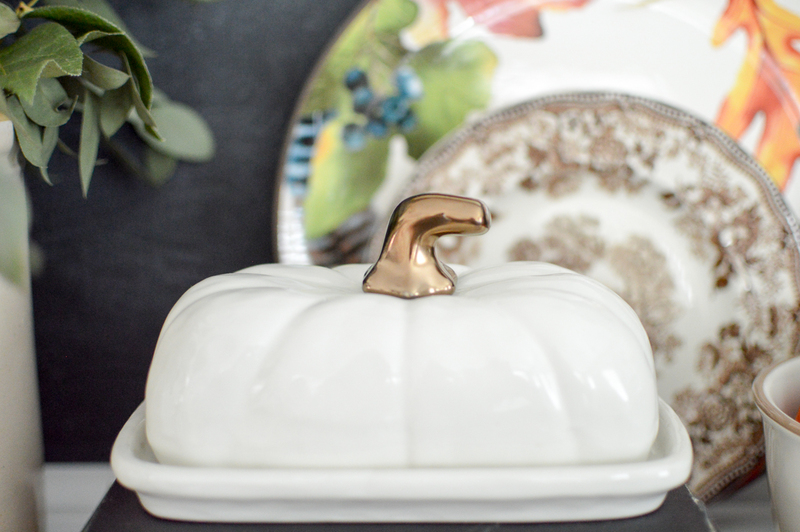 Who says you can’t have a butter dish pumpkin on the mantel? Not me! 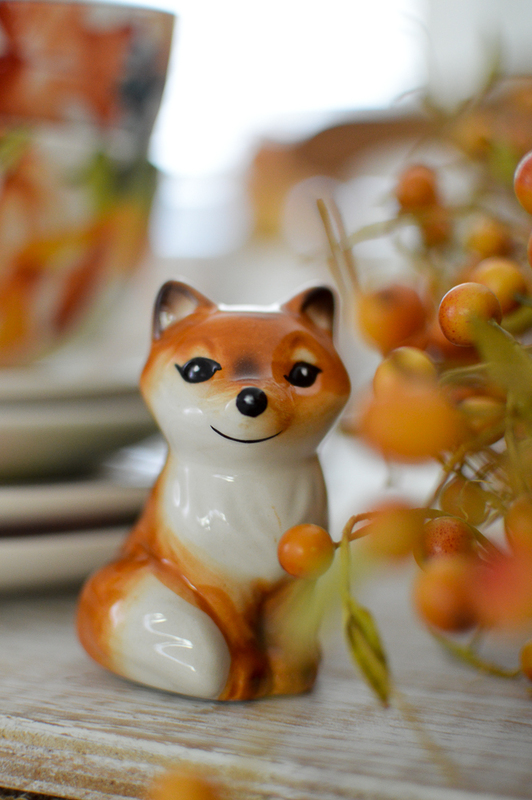 The hints of deep, coppery bronze on the stem, and on the little Foxes, are so pretty. I love a little sparkle. 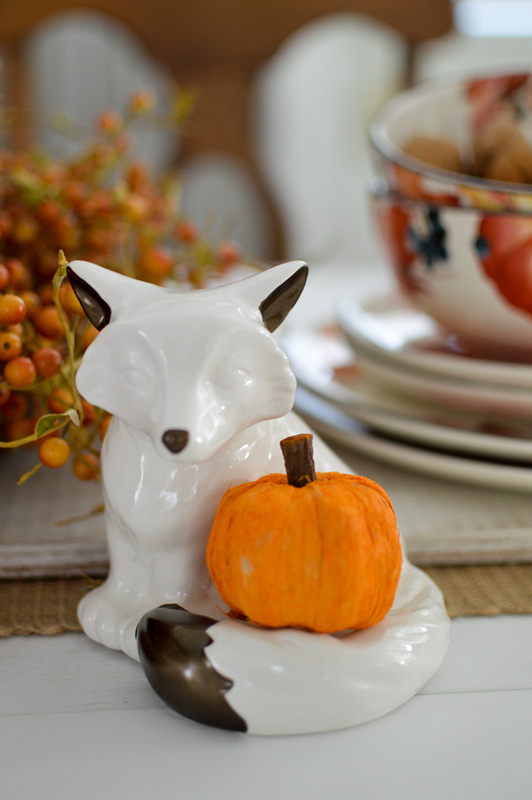 The Fox is a tea-light holder, but he wanted to join in the Fall festivities too. 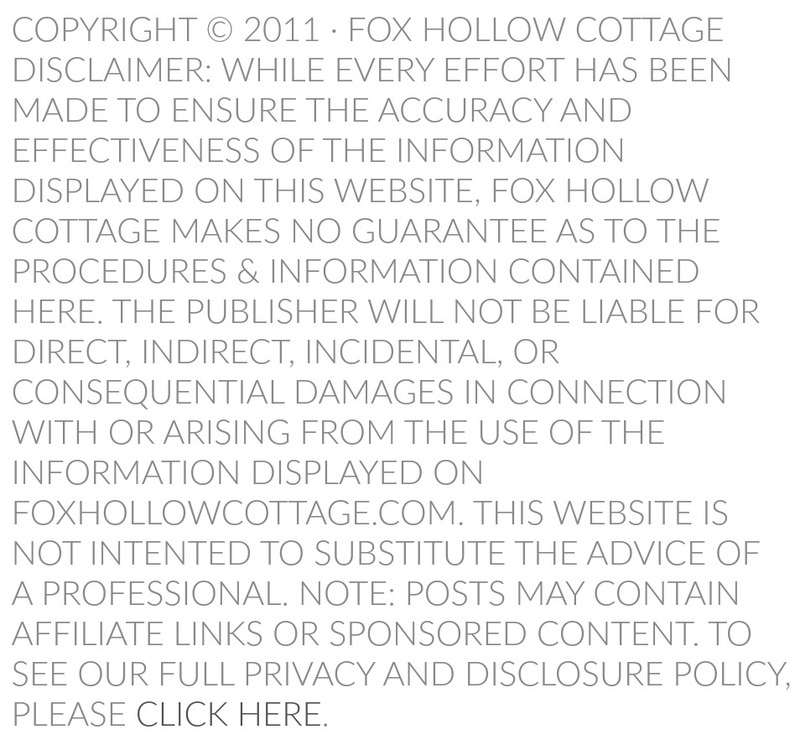 If you ever wondered what the Fox says… that was it. “I want a pumpkin.” Mystery solved. 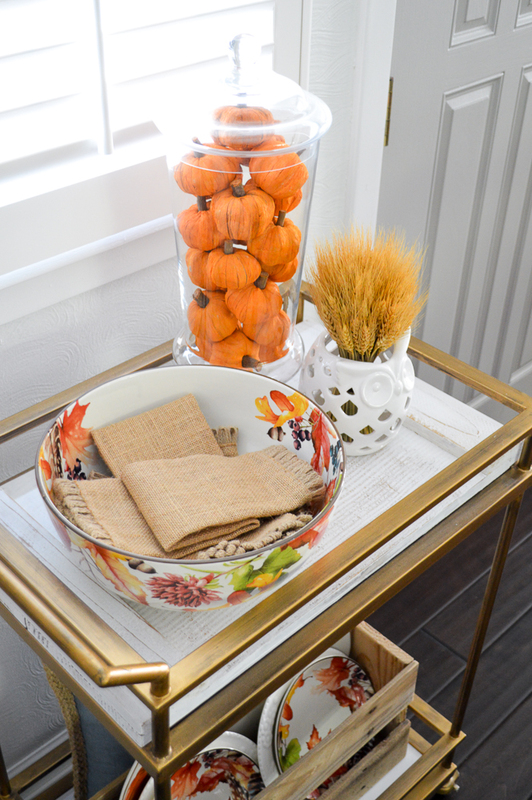 If you ever have the opportunity to grab a bar cart, do it. Handiest things ever. I’ve used this one all over, but it’s back here for the season, just in time to work hard & look pretty. 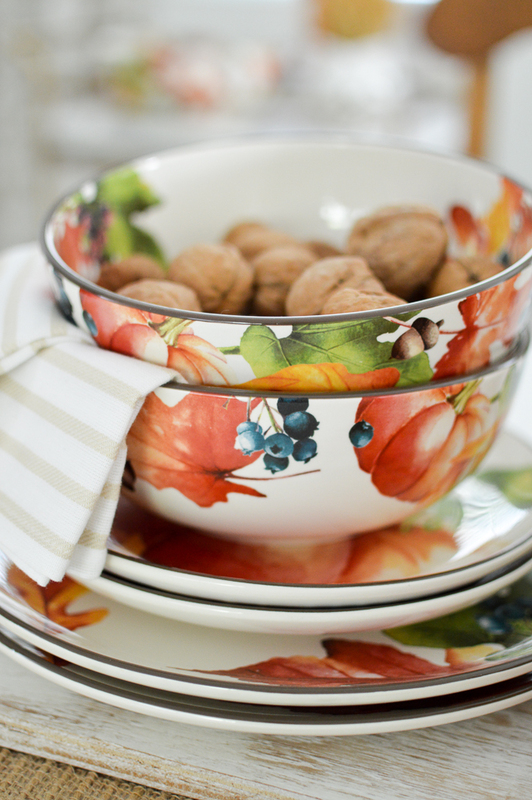 I didn’t buy the big serving bowl last season, but I couldn’t resist this year, it is so pretty. The colors are so vibrant and lively!! And they added the loveliest feathers this round. Someone got a new “do” – Looks pretty carefree to me. Maybe it’ll catch on? 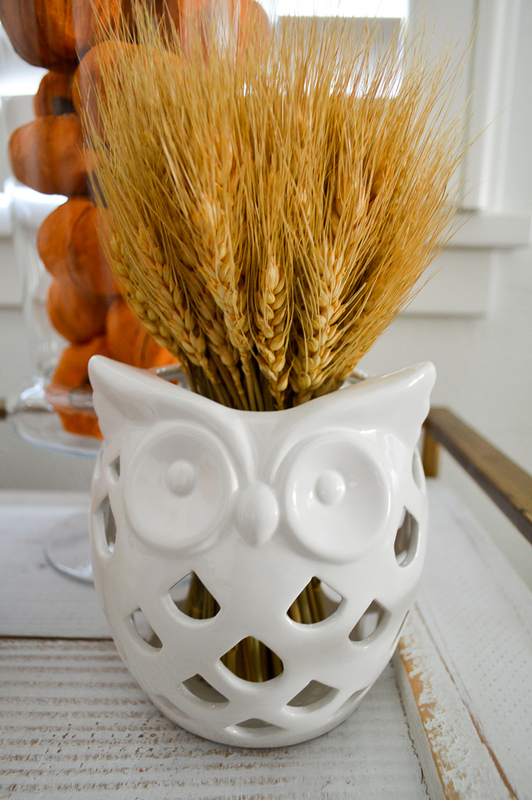 Again, the Owl was meant to be a tea light holder, but I tried this instead. 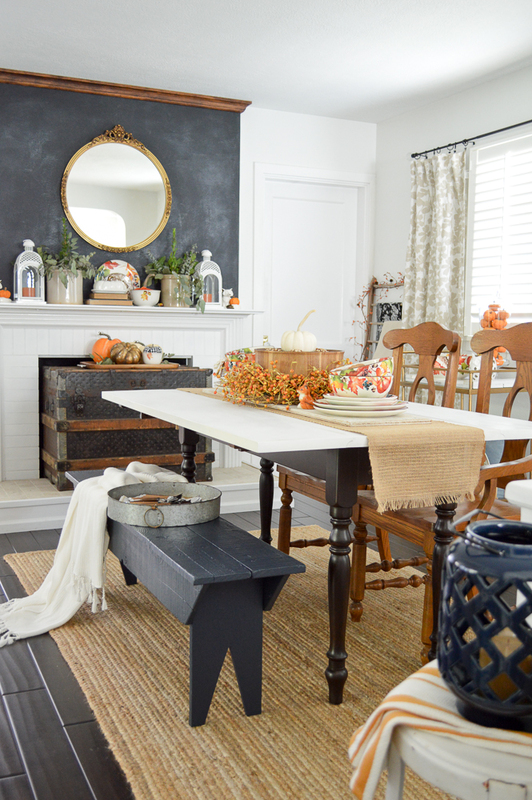 I think the texture is fun & definitely very “Fall”. A few more layers to warm things up! 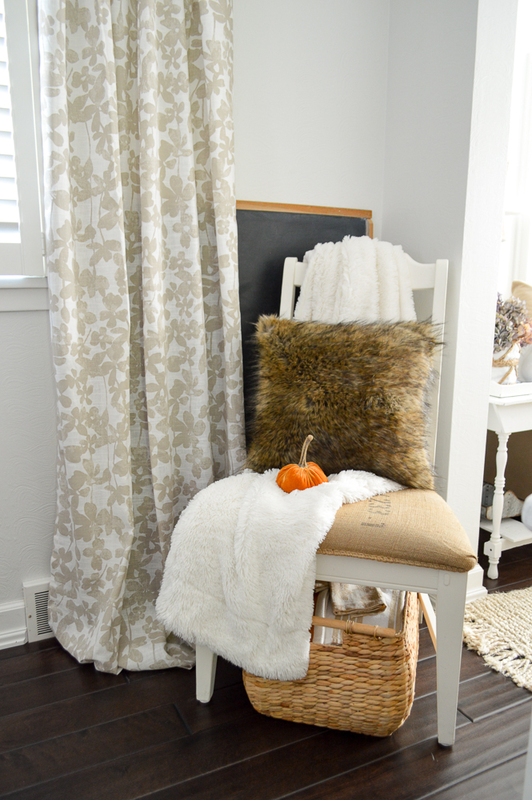 Cozy throws and fur pillows are within easy reach for chilly mornings, or to add extra cushion for tired backs. 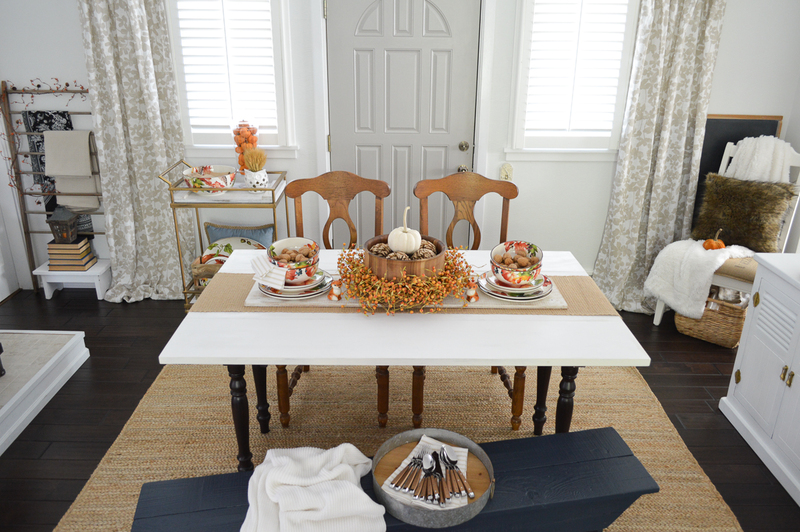 I’m going to share a full “table setting” later, but for now I thought seeing how you can enjoy your dishes, in a very simple, informal arrangement might be nice. 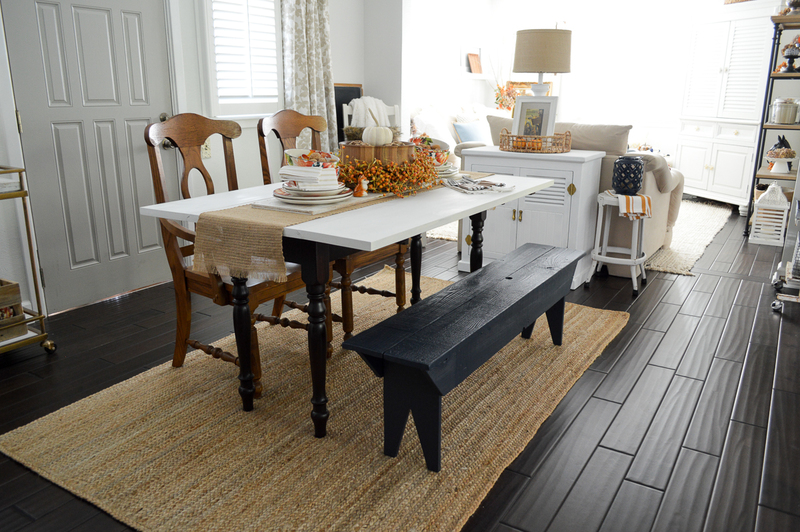 I am absolutely & thoroughly enjoying this table every day! The colors are simply sublime! 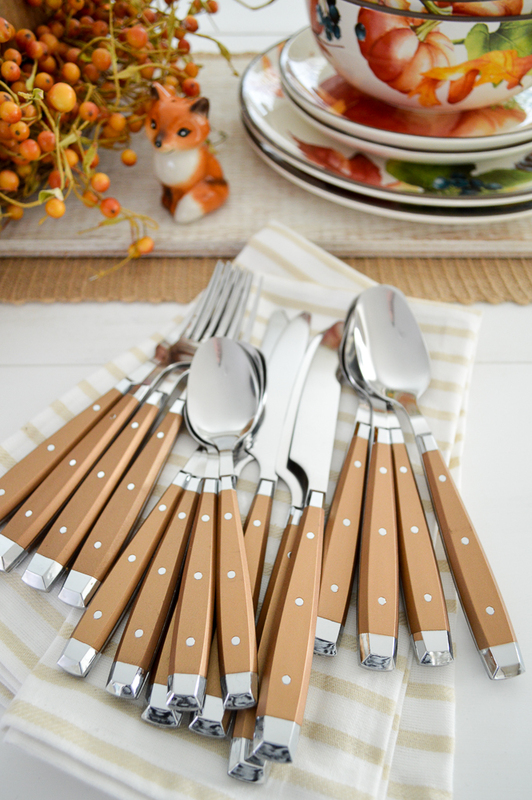 This decadent metallic flatware has got me a little bit excited to do the real-deal table. 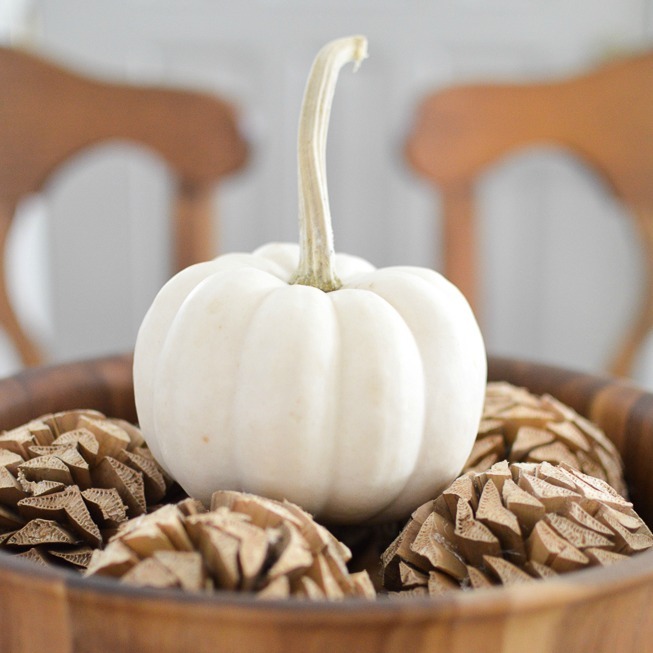 I’ll probably need to invest in a few fresh pumpkins for the table too… can you believe this, is the only real one I’ve bought so far? I can’t. It definitely needs some pumpkin pals!! 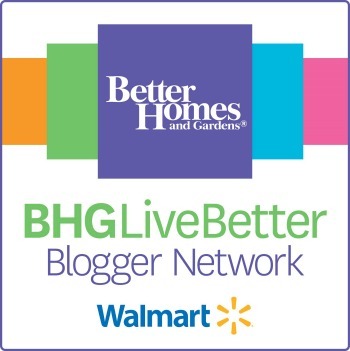 I feel so lucky to be a part of the Better Homes and Gardens Blogger Network team! Very pretty Shannon! 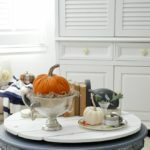 I especially LOVE that bittersweet wreath! 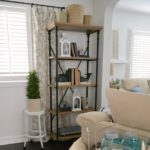 I have shopped for faux bittersweet but have never found any that look authentic enough to me. I’m wondering where you found yours. 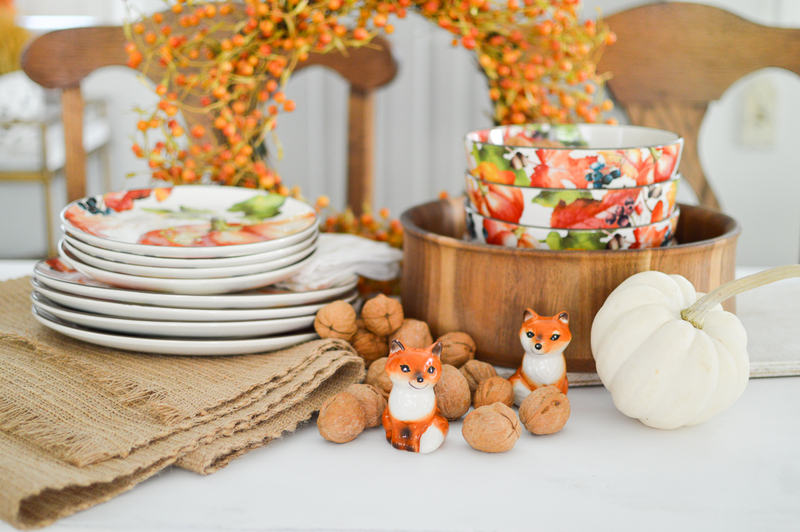 I also love the little foxes. They have always been one of my favorite animals. 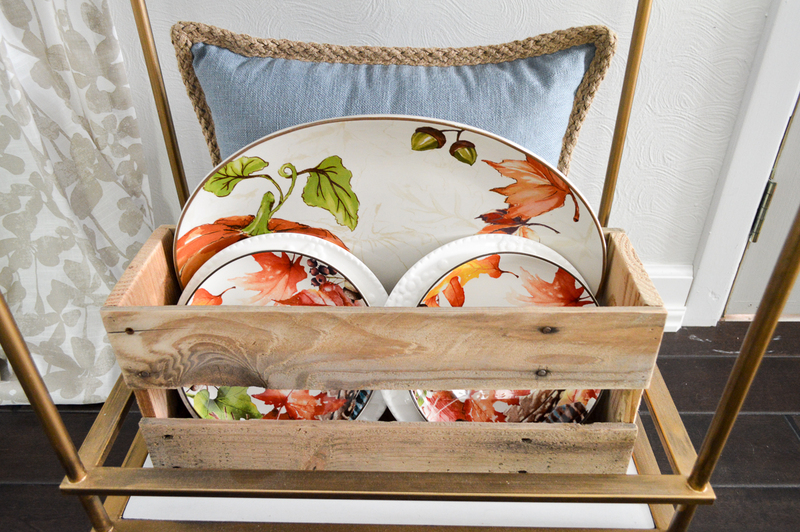 Thanks for sharing your Fall decor. Hi Naomi ~ I got that at HomeGoods, many years ago. I feel like I’ve had it for maybe 7 years? I’ve got it in white too. They are my go-to. Thanks so much for stopping by 🙂 Happy Autumn!! 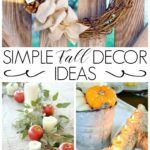 I love the fall theme throughout your home! 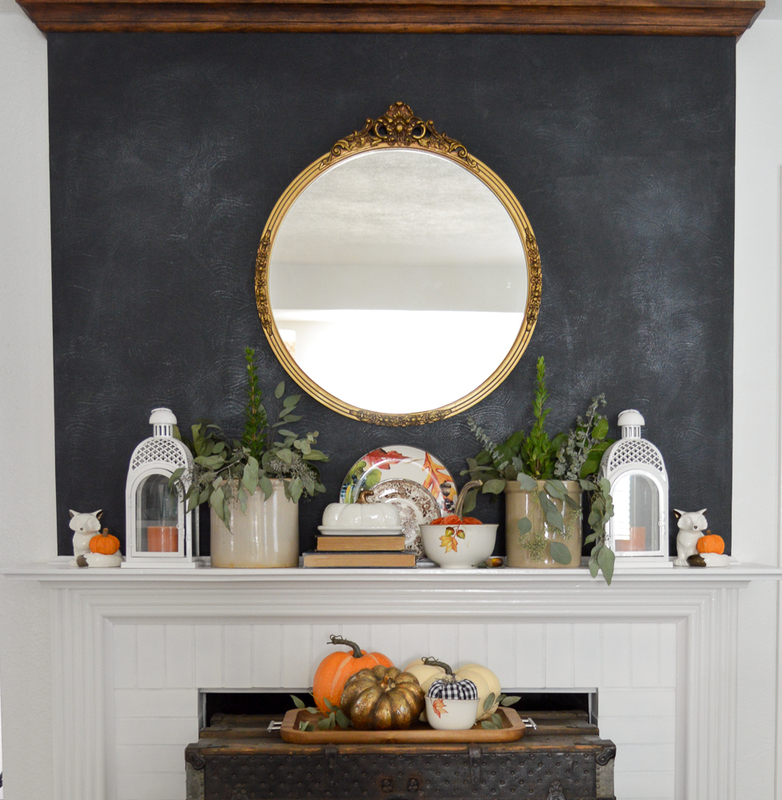 I’m trying to decorate for fall, instead of just Halloween. 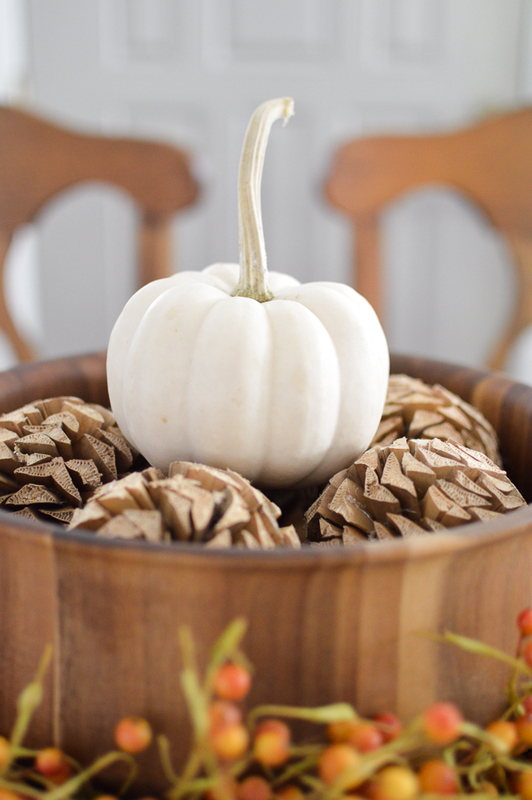 That way I can leave my decorations all season, making subtle changes for Halloween and Thanksgiving. Thanks for the inspiration. Very smart! When you go natural, it’s easier to pepper in a bit of Halloween, then remove and go into Thanksgiving 🙂 Good plan! 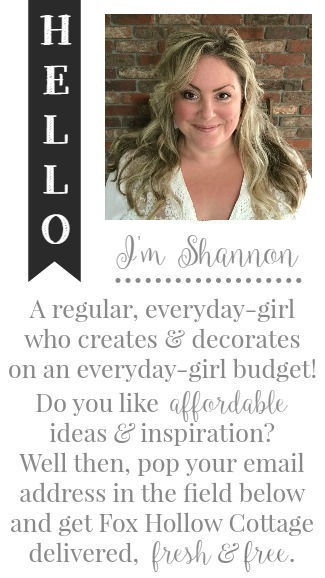 Oh my gosh Shannon! This is all SO gorgeous! I mean the bowls, the silverware, the navy, the bench, the walnuts ( they bring back memories of Christmas mornings when I was little 🙂 it’s all so perfect and jaw dropping beautiful! It looks so good Shannon!!! And I can rest now that I know “what the Fox says”!!! 😉 love the pops of navy too! 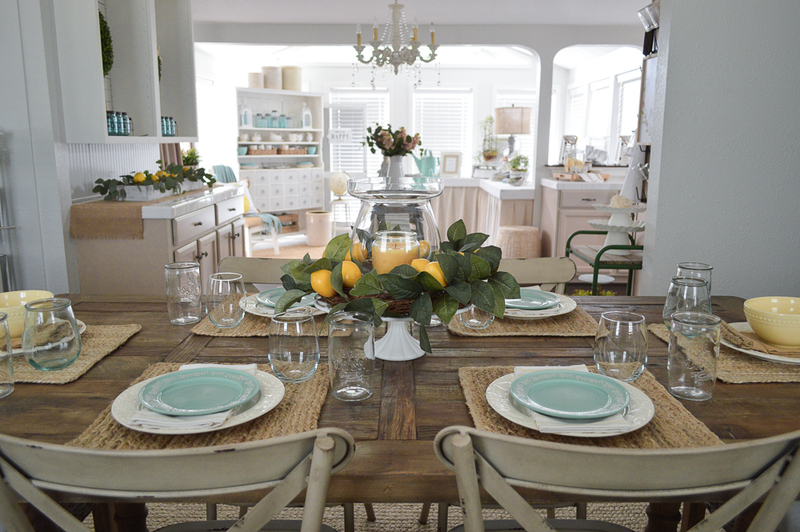 Love the dinnerware. 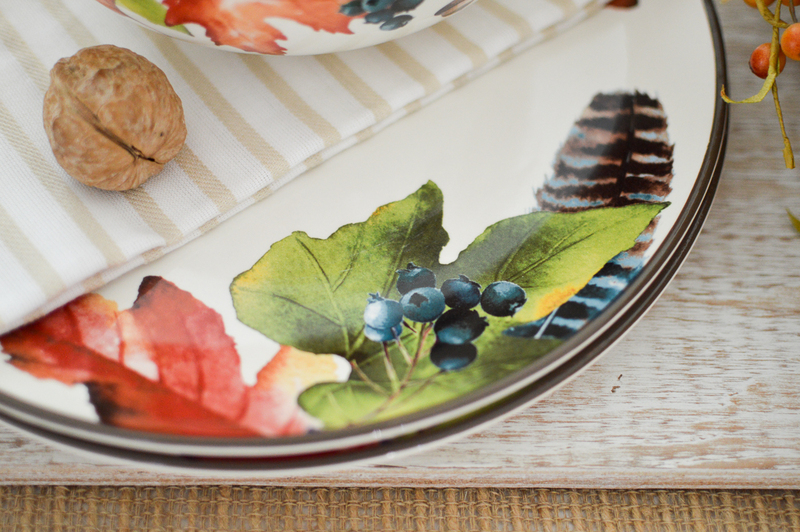 Such pretty Fall leaves and acorns with just a perfect touch of navy in the blueberries. Aren’t the images on the dishes so beautiful. I love the pinch of blue this year, and the feather! So glad I got to add them to what I already had 🙂 Happy Fall Anna!! Shannon! 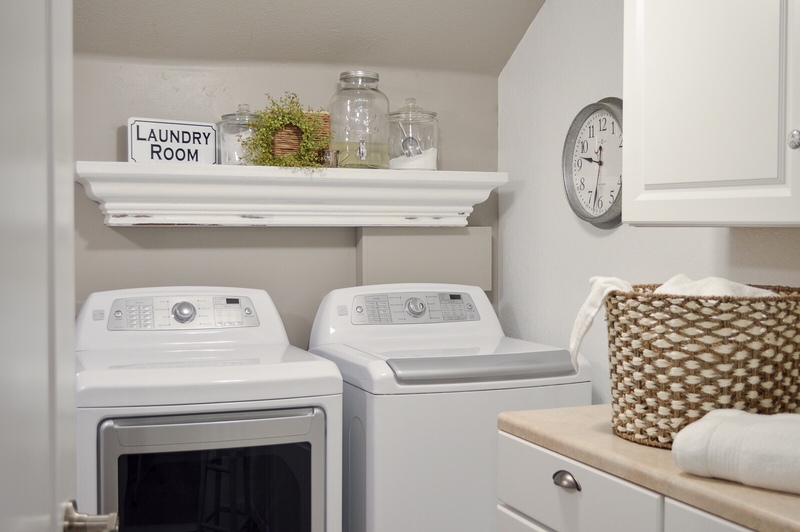 Your whole house is so so cute! 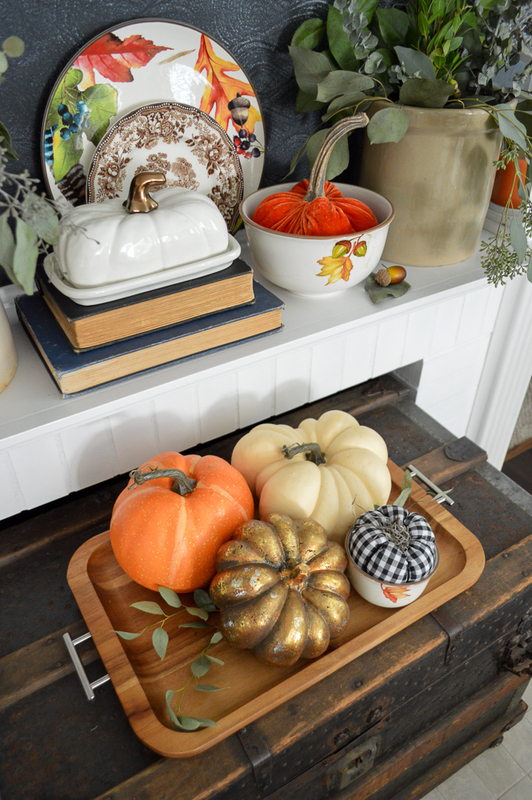 I love all the fall decor, pumpkins, and that pumpkin butter dish is adorable. Great job! Thanks so much Heidi, Happy Fall!! I LOVE it!!! Every detail is SO beautiful, and I’m glad to know what the fox says. 😉 Pinned! Thanks Anna. I’m sure that was keeping you up at night. Awe thanks! I figured why not? 🙂 Have a beautiful Fall season friend!! So pretty, and I’m so glad to finally know what the Fox said!! Glad I cold help out there. 😉 Thanks so much! This is one of the neatest posts I have read in awhile. 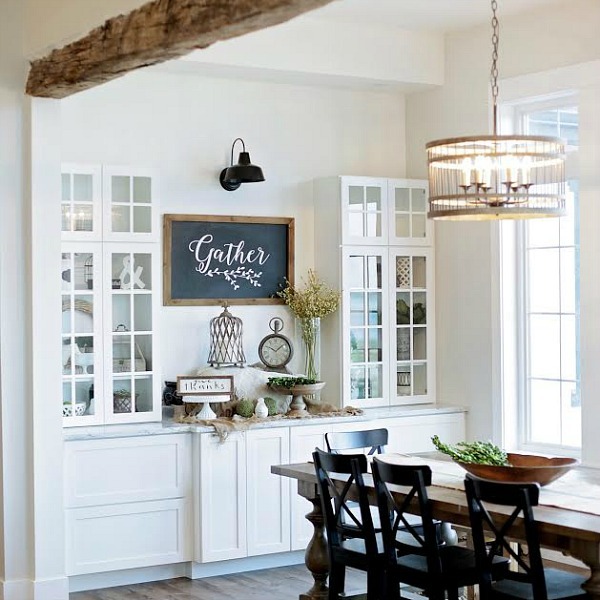 You have some great ideas and I love the overall look! 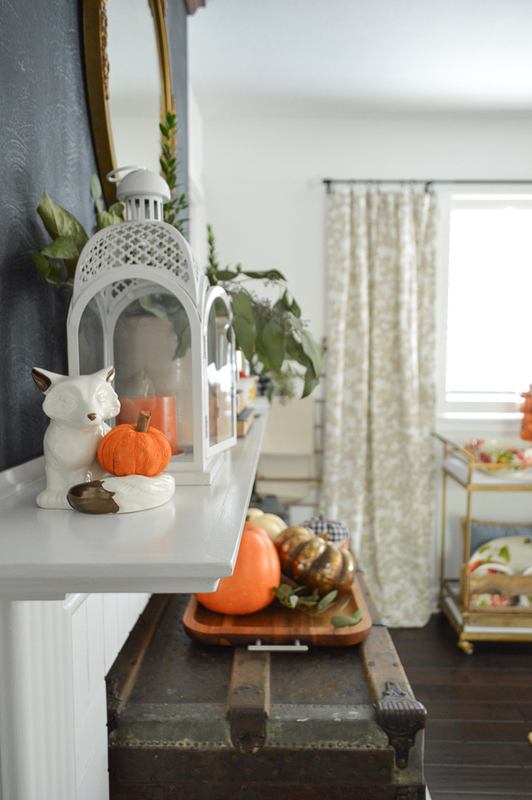 The fox is too cute and I don’t mind the mantel either. 😉 Very nice, thank you. As always, I love your decorating skills. Looks amazing. 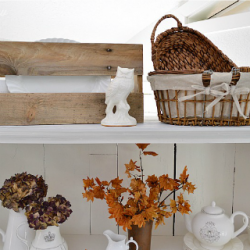 And the old trunk in/on your fireplace? Genius! 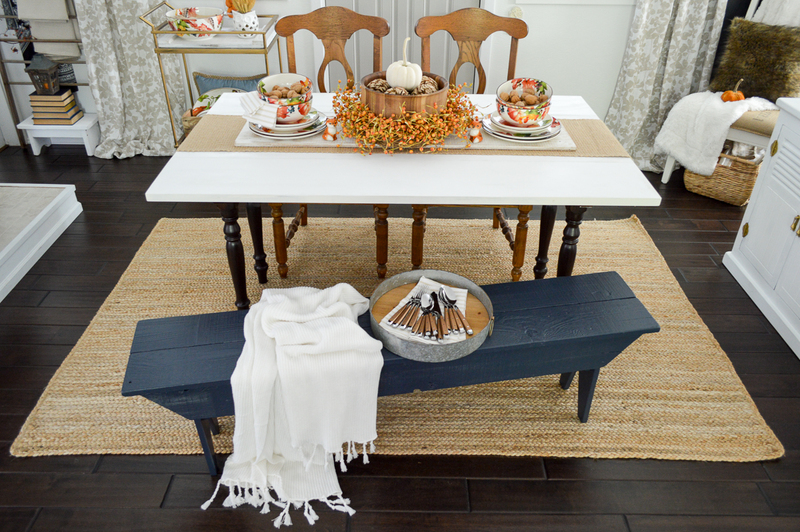 Double Your Decor With My Fall Table Decorating Ideas. 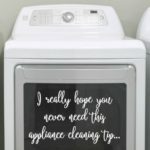 Don't Keep Your Dishes In The Dark! 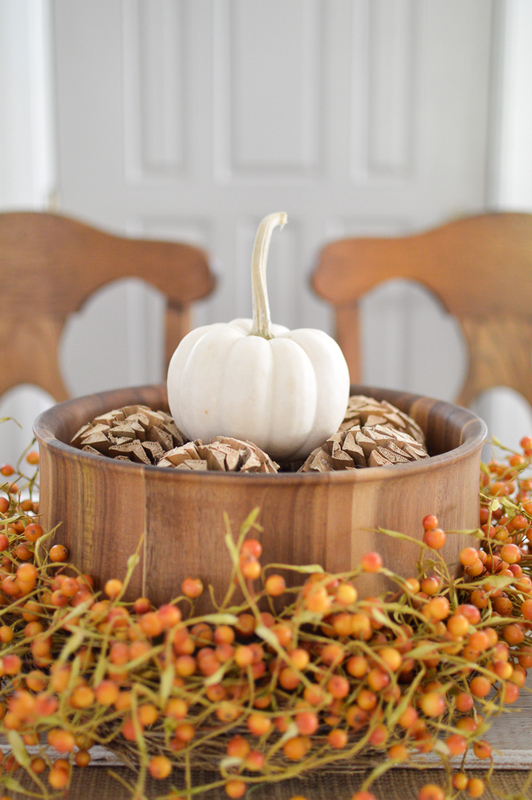 Create a Simple Centerpiece & Enjoy All Autumn Thru Thanksgiving.